Melanoma is an easily treatable disease with nearly a 100-percent cure rate—assuming you discovery it before the cancer metastasizes. A newly FDA-approved imaging device—based on a guided-missile navigation system—will find suspect moles faster, easier, and more accurately than ever before. According to estimates from the National Institute of Health, some 70,000 Americans will be diagnosed with melanoma this year—though 16 percent will find it after the disease has metastatized and will have just a 15-percent chance of surviving more five years. Normally, when a dermatologist is inspecting moles for biopsy and further study, he selects his specimens based on rigorous guidelines as to the growth's size, shape and color. 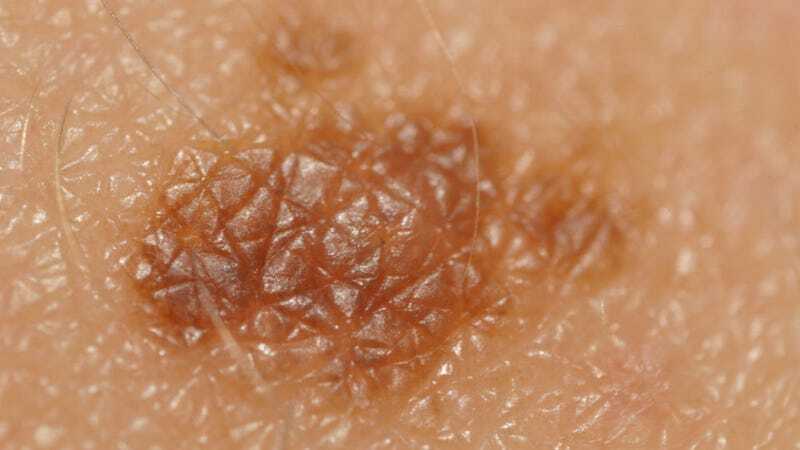 Most cancerous moles are relatively easy to spot—they're the big, oddly-shaped ones—but many others that may be just starting to turn are much more difficult to diagnose. "Every day patients come in with 20 moles on their back and the dilemma is, which ones are suspicious and need to be biopsied?" said Dr. David Pariser, former president of the American Academy of Dermatology told HuffPo. "The diagnosis of melanoma is the most serious one a dermatologist makes, and we have sleepless nights worrying about it." Dermatologists across the country will sleep easier once the recently FDA-approved MelaFind device hits the mainstream. Developed by the MelaScience company and adapted from a 1990's DoD Target of Interest Identification program, this revolutionary system objectively and accurately analyzes suspicious moles for early signs of melanoma. The MelaFind imaging system, which was made available in October of 2011, stands about five feet tall atop a rolling base and utilizes a handheld scanner with a Zeiss lens. When the dermatologist presses the scanner against a mole, the scanner emits 10 unique wavelengths of light, records those images and then applies a set of proprietary algorithms analyzing the various aspects of the mole and comparing them against a database of 10,000 clinical images of moles that had been biopsied. The system will arrive at a conclusion within a minute and alert the doctor to the mole's likelihood of being cancerous. Despite a 98-percent accuracy predicting melanoma in clinical studies and a 90-percent reduction in unnecessary biopsies, the device has faced immense contention to receive its FDA approval. Members of the FDA worried that the technology could lull doctors into a false sense of security or provide misleading results (roughly eight percent of results from a recent study were returned as "unevalubale." In fact, the FDA only approved its limited use by specially-trained, board-certified dermatologists by a vote of 8-7. That lack of faith by the FDA is certain to delay this technology's wide release. Currently it is only available through 200 dermatologists in the Northeast and Germany—each of which has to shell out $7,500 to lease the device and undergo training to use it. Patients will have to drop $150 of their own money as well—MelaScience won't be submitting it for insurance coverage for a few years still. MelaFind has the potential to provide dermatologists with significantly more information about indeterminate pigmented skin lesions to help us when deciding on which lesions to biopsy to detect melanoma as early as possible. While there have been incremental improvements in imaging tools for melanoma detection, we still primarily rely on our judgment based on a visual examination to select the lesions to biopsy; data show that this is often not enough.